This 19th-century photograph was printed on very thin paper and glued to a stiffer paper mount. At some point the mount was trimmed to the dimensions of a postcard, possibly so that it would fit into an album. The back is blank. I bought it from a dealer in Suffolk, England, who couldn’t tell me anything about it. I looked at pictures of stringed instruments online and concluded that the man in the photo must be holding an Indian instrument called a tambura (tanpura). The Metropolitan held the first retrospective exhibition of Y. G. Srimati’s paintings from Dec. 2016 to June 2017. Tanjore is the Anglicized name of the ancient cultural city of Thanjavur, in southeastern India. Hindustani musicians prefer the word tanpura, while Carnatic musicians use tambura (Wikipedia). The carved jackwood tambura has a face! The photograph of the man is wonderful. I wonder what is the significance of the picture to his right. It’s as though it’s all wrapped in symbolism of a special moment. Very nice share! I don’t know how to interpret the picture to his right, or the patterns on his clothing, or his body paint, or even the patterns on the rug, which might be calligraphy. I do hope visitors will share their insights! So marvelous! I love the musician’s clothes and body paint! 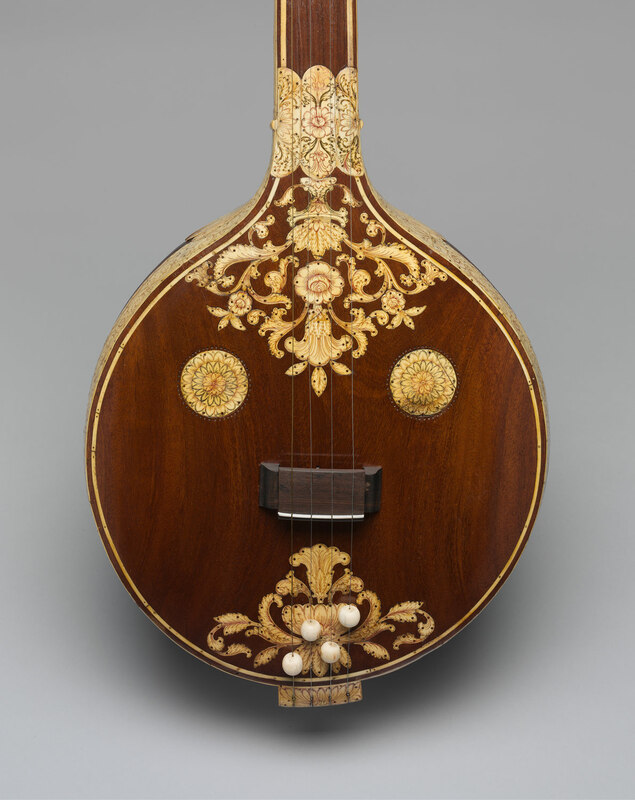 I am sure I can find somewhere on line to listen to the tambura. What a fascinating photograph! I’d love to know the story behind it. Great photo! I’m sure that his clothes/hat/bodypaint could tell you a lot more about him, but it is nothing I know anything about. I accumulated quite a bit of knowledge about ornaments etc. around the world through working at an ethnographic museum, but it is acquired more accidentally than systematically, and nothing I see in this photo rings any bells. He seems to be standing on a cushion shoved underneath the carpet – I wonder why? Thank you! I think he’s standing on a stool to position him ideally against the painted backdrop. The photographer would have had a variety of stools of different heights to choose from. The backdrop itself is very unusual. I’ve never seen a jungle-themed one before. I wonder if he is wearing a string of little round bells around his ankles. I have sold similar bells on bracelets and anklets to belly dancers on eBay. I bet you’re right! Great observation!